In an ever-changing and competitive work environment, it can be difficult to distinguish yourself from your peers. You want to exemplify professionalism, qualification, and dedication to your organization, industry peers, and to yourself. It's no easy task. Begin the certification scheme, now. Becoming qualified in asset management offers numerous and extensive benefits along your professional journey. It provides you with a national and internationally recognized qualification and demonstrates your commitment to the asset management field. The Asset Management Certification Scheme offers numerous key benefits to the global asset management community. For organizations, there is improved business performance by increasing opportunity for recruitment, workforce retention and attraction, and transportability of people. There are 4 Levels an individual can achieve. Certified Associates are assessed on knowledge and experience. They will have an awareness of the Competency Elements that comprise the Asset Management Profession, and an understanding of the contribution that they make to the successful application of the principles of asset management in their organization. Certified Practitioners will have demonstrated achievement in a range of competencies that comprise the Asset Management Profession, and will have an understanding of the contribution that they make to the successful application of the principles of asset management in their organization. Certified Senior Practitioners will have demonstrated advanced achievement in a range of competencies that comprise the Asset Management Profession. A Senior Practitioner provides significant tactical contribution within a broader set of guidelines and objectives, and a degree of synthesis of strategies and higher level objectives. Certified Fellows provide a strategic contribution within a broad set of guidelines and objectives, displaying a high degree of synthesis and an ability to readily solve complex asset management problems. Certificates are valid for three years. You may apply for recertification either from six months prior or up to three years after the expiry date. Recertification will be valid for another three years ongoing from the expiry date of the original certificate. 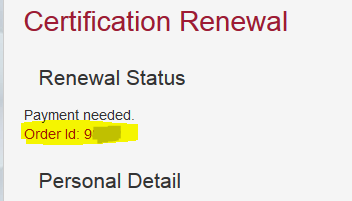 To apply for renewal click here or alternatively logon to our website and then select the 'Certification' tab. Here you will see a list of your accreditations earned through the Asset Management Council. If your certificate is nearing expiry, or has expired within the last three years, you will have the option to select ‘Renew’ which will prompt you to confirm the amount of CPD points earned since you last applied for accreditation. It is important to keep a log of Continuing Professional Development (CPD) points especially for this reason. All of our members have access to an online log which can be accessed and viewed here. Please note that points earned for attendance to Asset Management Council events will be automatically listed in your log. You also have the option to manually enter other CPD points accumulated from events not with the Asset Management Council. Once you have applied to 'Renew', providing the amount of CPD points meets the set requirement, you will receive an invoice and then will be able to download your current certificate online once payment is made.